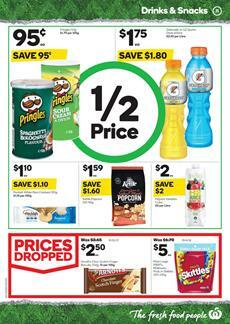 Shop for Pringles, Gatorade, Kettle Popcorn, H2Juice, Coca-Cola, and more in the drinks-snacks range of Woolies. Buy Smith's crinkle cut chips for only $3! Celebrate with tasty food and beverage. Make great desserts, have a big breakfast with the products from Woolworths. Bega peanut butter is one of the top products in the pantry sale. Save $1.10 on the peanut butter. Get your breakfast foods like Kellogg's cereals at Woolies stores. Some prices will be lower for certain products. For example, Kellogg's Rice bubbles will cost only $6! Restock elementary items of your pantry and breakfast such as coffee. Nescafe Gold original coffee costs only $9 which is a half-price deal. Discover the new flavours of products such as Well naturally chocolate. Woolworths offers a range of healthy foods like that. Visit pg 14 to see some of these. Check out pantry products like Continental pasta & sauce or rice. Buy certain products at half prices. Woolies covers plenty of pantry items and fridge foods on pg 16&17. Mama noodles, hakubaku noodles, and more Asian foods will be on sale for the prices you see on the catalogue. Follow our Facebook page to get more of these posts. Italian or Mediterranean foods or additional flavours to your meals are available on pg 17 where Parmesan, olive & basil flavour of OB Finest or Cracker Barrel infused cheese are available. These items may really change your understanding of food. Don't forget to see all these offers. Additionally, many exclusive deals are available in the content of this catalogue. Check out the fresh-cut meat selection, cheese variety, new products like leg ham, and more in this catalogue. Follow our Facebook page to track these deals or subscribe to get emails.